This sturdy frame canopy has a welded tubular steel frame with an innovative collapsible design. Synthetic joint components and lock nut joint construction ensure high performance with every use, and the baked on powder coating eliminates any chipping, weathering, or peeling. A truss top design makes the frame even more strong and stable. The polyester top is a full fitted valence that stays attached. It will resist fading, aging, and mildew so that it will keep its fresh look for a long time. The canopy's seams are sealed with waterproof tape to prevent drips, and there is a double-stitched polyurethane lining. Adjustable legs make it easy to get the canopy at just the right height.Wide based foot pads make the whole structure stable and provide secure anchor points if necessary during windy weather. A wheeled storage bag is included. I am interested in finding out how much this weighs and if a logo can be put on this? How does this affix to cement or pavement or is it just for grass? Any of our popup style canopies may be used on concrete with proper weights, however, if you are looking to have the canopy be permanently secured to concrete via anchors, popup canopies should not be considered as they should not be left in the elements for extended periods of time. 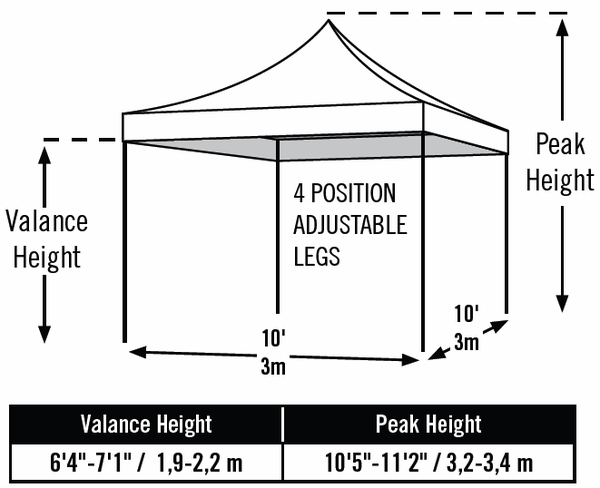 For this, a frame or pole tent should be considered. Also, we do not offer custom graphics on any of the prepackaged canopy deals offered on our site and the only way to receive pricing for this is to fill out our custom graphics form. This product weighs approximately 57 lbs. I am looking to purchase a canopy for some outdoor events that I am setting up. This is going to be in parking lots mostly for farmers' markets and festival for a medical facility. I will have a 4 foot table and, at times, a massage chair under the canopy. I also am in a valley so we can get some gusty winds and rain. I would also be setting up the majority of these by myself so I do need something that is easy to set up and take down. What would you suggest? As this canopy has an accordion style frame and weighs only approx 57 lbs, it is very easy for a one-person setup. Please keep in mind that per the manufacturer you should stake down or weigh down the canopy inclement weather. This top is water-resistant not waterproof. No, this canopy does not have a waterproof top. 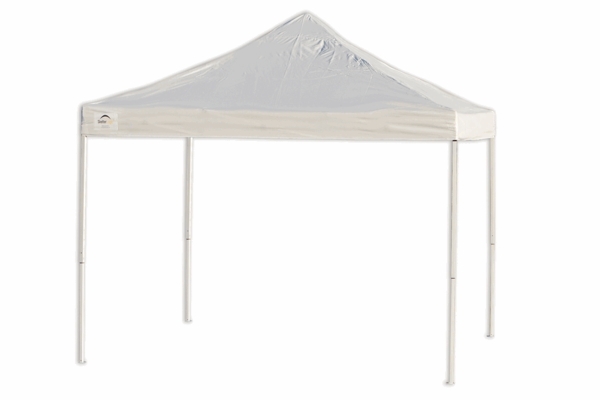 The only 100% waterproof 10 x 10 pop-up canopy we offer is the Vitabri V3 10 x 10 Aluminum Pop Up Canopy. It seemed to leak around the seams. I would assume that you would scotch guard it so that the rain wouldn't come in the seams. I'm going to buy some scotch guard tomorrow and hopefully it will be great. Other than that, I do like the fact that if I had to, I could put it up myself. Thanks! It seems heavy. ProsI can put up by myself/ good in wind = I have 40 lb weights at each corner. I'm a stained glass artist and have always used the frame of my canopy to hand my pieces from.....some can have considerable weight. Because of this, when my old display finally bit the dust I knew I needed another canopy that was easy to set up while also heavy and sturdy enough to hold my glass panels. This display certainly has been exactly what I needed.